The Supatool is a fixed heavy-duty cast metal handle particularly suitable for artwork, crafts and model making and the cutting edge requirements of the handy person and D.I.Y. enthusiast. The handle is opened with the aid of a screwdriver or small coin. Handle length 123mm, width 19mm, thickness 9.5mm. 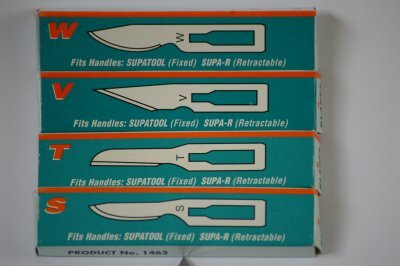 There is a choice of 4 heavy-duty blades: S, T, V and W.
The Supatool Supa-R is a Retractable heavy-duty cast metal handle particularly suitable for artwork, crafts and model making and the cutting edge requirements of the handy person and D.I.Y. enthusiast. There is a choice of 4 heavy-duty blades: S, T, V and W.